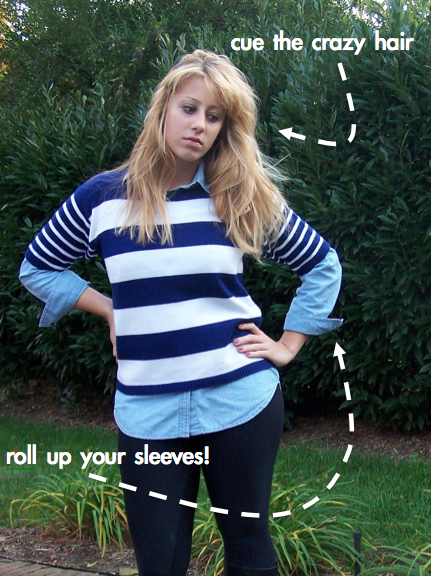 I've never understood short-sleeve sweaters or crop tops; why would anyone want cold arms during sweater season? Who would pay money for a too-small shirt and willingly bare their midriff? Of the very few shopping rules that I follow, these two, very sensible thoughts have dictated many of my purchases over the years. That is, until I found a striped & cropped, short-sleeve sweater during my last thrifting spree that changed my mind forever. Ah, the power of stripes! Against my better judgement, I snagged this top thinking that I might get inspired. Cue thrift purchase numero deux: a lightweight chambray tunic in the perfect shade of blue and the perfect length to layer under my new striped purchase. C'est parfait! P.S. don't forget to check out the new additions for sale: Splendid, Lily Pulitzer, See by Chloe, and Max Studio! Cute! Great striped top find! We just loved the CRAZY HAIR. You look so great! Love your boots!! Cute outfit! I like how you combined the chambray shirt and stripped sweater! love the bold blue stripes and awesome crazy hair! Love the stripes. Such a cute outfit with tons of personality. Great striped outfit and love the crazy hair!! I follow you blog from Spain. You look pretty... I love stripe anything and everything!